These homeowners probably don't mind if a bird happens to fly into the room from that leafy deck outside. They've got sleeping cots out there that they use as much as the bed. There's almost nothing keeping the outside out, certainly not the tall windows with hopper toppers. These window toppers open inward when it's too chilly to keep the door open. Privacy isn't an issue in this bedroom, so the windows are unadorned with shades or blinds. That branch-themed bedspread looks lumpy enough to hide a cozy down comforter, meaning almost no amount of cold is going to require heat in the bedroom at night. 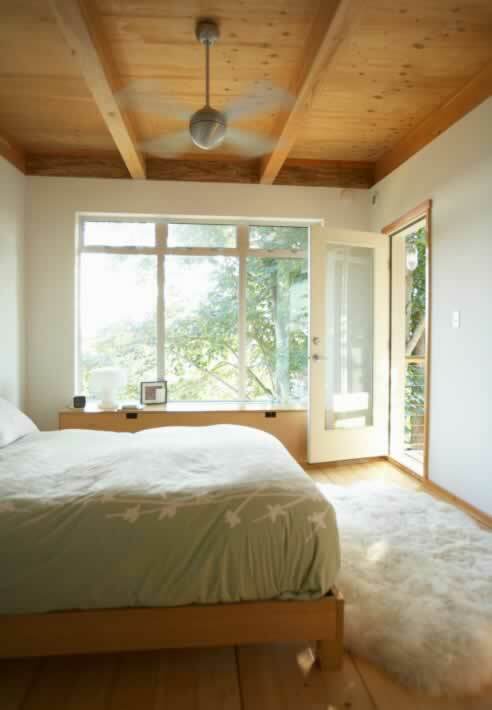 This is the perfect bedroom for people who spend their days kayaking on the lake or tracking down an elusive warbler. Let the sunlight bounce around those white walls. Enjoy the natural tones of the flooring, moldings and storage chest. If you must sleep indoors, this is the place.